Fire has long been held sacred in the indigenous religious traditions of South Asia. I have been to Sargodha city in Pakistan’s Punjab province many times. In fact multiple times in a year, throughout my childhood. This is where my family comes from – both maternal and paternal. Despite all my trips, however, I have never visited the shrine of Naghyana in a village called Dharema, about 10-odd km from the city. Composed of two graves, it is an extraordinary shrine, dating back to the 17th century. The first grave is said to belong to Prince Murad Baksh, the youngest son of Emperor Shah Jahan, who had joined hands with his older brother Aurangzeb to take on their brother, Prince Dara Shikoh. However, after Aurangzeb defeated Dara Shikoh, he put Murad Baksh to death, clearing the way for him to become the emperor. The story of his grave being at this site, however, is unlikely as Prince Murad Baksh was put to death in Gwalior. The second grave is said to belong to the saint Naghyana, who is believed to have given refuge to Murad Baksh. The progeny of the saint eventually came to be known as Naghyana. The word Naghyana is believed to have been derived from Naghe, an epithet used for Naga Sadhus, the naked ascetic devotees of the Hindu deity Shiva. Covered in ash dust, sporting long untrimmed hair, and known to consume hashish incessantly, these sadhus defy all societal norms and prefer to live in seclusion. There is also a long established tradition of naked Sufi ascetics, connecting all the way back to Udasi sadhus, followers of Shri Chand, the eldest son of Guru Nanak. In devotional art, Shri Chand is usually depicted almost naked sitting in a yogic position next to a fire. He has long, ragged hair, just like a Naga sadhu. Like these sadhus, the Sufi dervishes too let their hair grow long, and believe that hair is the source of life-energy. It seemed that the Udasi, as devotees of Shri Chand later came to be known, also borrowed heavily from the Shaivite sadhus, just as the Sufi ascetics or dervishes did. Perhaps Naghyana was one such Sufi ascetic. There is another legend at the Naghyana shrine about the fire that the saint lit. Fire acquires a particular symbolic and religious significance in ascetic Sufi tradition. 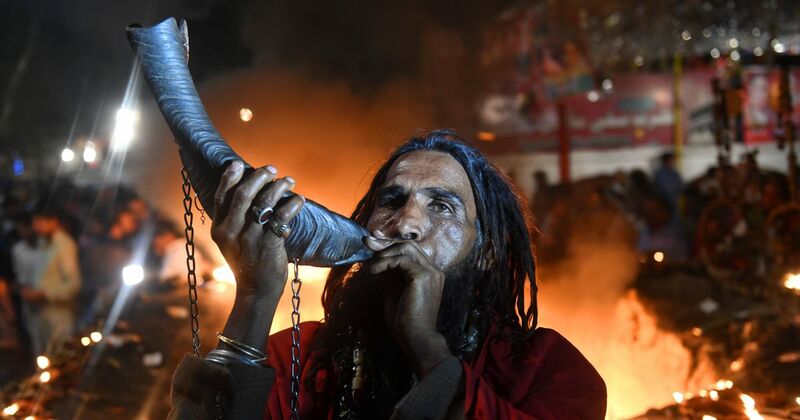 Many popular Sufis are believed to have their dhuan (smoke), which, in this case, specifically refers to the place where they lit their fire and sat. For many such Sufis their dhuan became a place of veneration after their death. The situation at the shrine is quite similar. At the shrine, it is narrated that the fire has remained alive ever since the death of the saint in the 17th century. His devotees have made sure that his dhuan survives. I am told the fire simmers – emitting more smoke than fire – at the centre of a room that is blackened by this centuries’ old smoke. Perhaps the fire comes to life during the annual urs celebration, the death anniversary of the saint, the day he is believed to have become One with the Divine. This entry was posted on Friday, August 24th, 2018 at 00:00	and is filed under Uncategorized. You can follow any responses to this entry through the RSS 2.0 feed. Both comments and pings are currently closed.